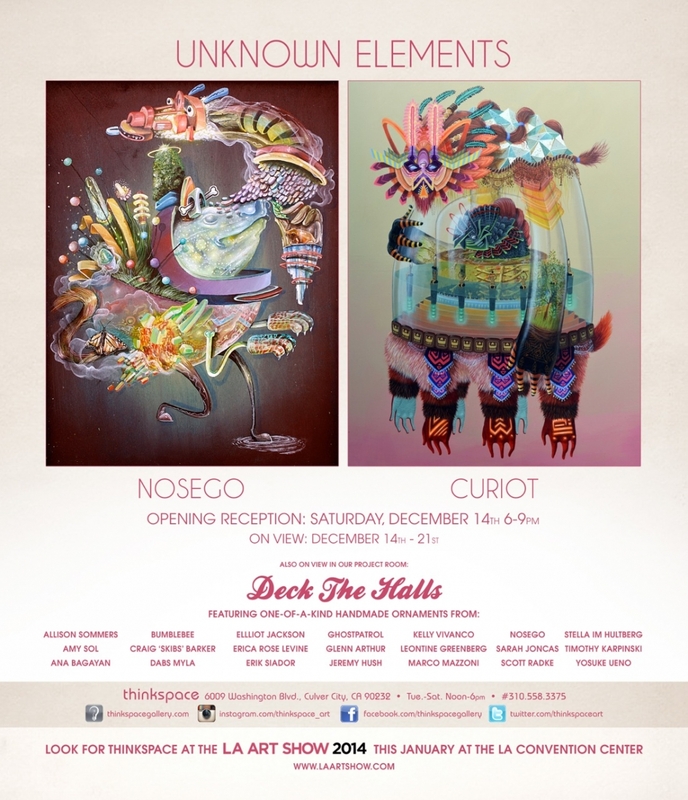 Thinkspace gallery (Los Angeles) – is pleased to present Unknown Elements, featuring new works by Nosego and Curiot. Both artists have unmistakably distinct iconoclastic styles, inspired in part by the graphic originality of their respective practices as street artists. Both work with elaborate layers of imagery, building complex visual events through the disarming whimsy and creative disinhibition of the surreal. Constructing entire worlds of colorful, larger than life, composite creatures and hybrids, each artist explores the symbolic possibilities of juxtaposition; working with the known of the every day and transforming it constantly through free association. The iconicity of both artist’s work can be likened to the cohesive staying power of myth: their output is immediately recognizable as their own, populated by recurring themes, characters and motifs, and subject to the internal logic of its own creative cosmology. Philadelphia based artist Nosego, or Yis Goodwin, delves into the undivided creativity of his subconscious for inspiration. Unrestrained by the limitations of reality, his imagination is given free reign throughout his creative process. Nosego’s works host a wealth of quasi-mythological characters often in varying degrees animal, humanoid and object. By defamiliarizing the known objects of the world through the absurdist reconstitution of their parts, Nosego’s works are like Frankensteinian aberrations: beautiful, odd and entirely unknown. Childlike and unerringly spontaneous, the artist’s creatures are whimsically grotesque and captivating; culled intuitively from images or themes that resonate and linger in the recesses of the artist’s imagination. With the skill of an accomplished illustrator and graphic artist, Nosego’s images are concise and graphically powerful, expressing the pure unadulterated enjoyment in the creative play of their making. They are equal parts fantasy and technique, and reveal the impressive breadth of Nosego’s uncensored vision. Curiot’s works are similarly preoccupied with the expression of hybrid worlds. The artist draws his inspiration in part from traditional Mexican folklore to explore the contemporary re-expression of myth and symbolism. Based in Mexico city, Favio Martinez, alias Curiot, is inspired by the coexisting facets of urban contemporaneity and traditional Mexican culture, cultivating work that incorporates an appreciation of their intersecting cultural realities. The artist appropriates mythological narrative, and the totemic function of ancient and tribal art, to personalize the visual power of their archetypes. Curiot’s works are highly detailed, symbolist, and look to traditional ritual and even textile. The imagery is compellingly dystopian at times, suggesting some larger cultural conflict or irresolution at the heart of the work. With the inclusion of geometric patterns, beautifully vibrant colors and textures, tribal motifs, and folkloric imagery, Curiot creates highly detailed and saturated works that seek to engage the significance of cultural legacy from the vantage point of a contemporary psyche.